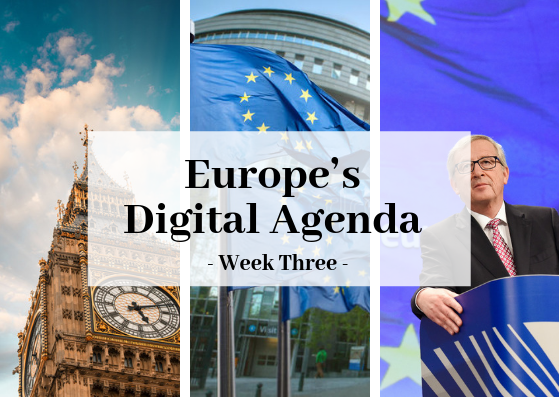 Welcome to this third edition of Europe’s Digital Agenda weekly summary. In this space we will try to uncover and detail last week’s European digital developments, highlighting the most relevant news as well as EU institutions’ forthcoming activities, as well as highlighting digital movers and shakers. Last week, we discussed key developments around 5G and cybersecurity across the member states, and the progress in the EU-Japan agreement on personal data protection. We also discussed a £1m tender to enhance the potential of digital hubs and accelerators across Europe. This week, we have an extremely busy European Digital Agenda that includes developments in the controversial EU Copyright Directive as well as key developments around Cybersecurity with a hack on an Italian agency, Brexit and the Pentagon’s commitment to invest $2bn in AI, which necessarily shines a light on Europe’s own AI journey. In this edition we will also present for the first time a look at The Week Ahead where we will help you decode the future by outlining the next week’s most relevant digital meetings and events. European Parliament passes a resolution to ban ‘killer robots’ on battlefield. The European Parliament has passed a resolution calling for an international ban on so-called “killer robots”. Members of the European Parliament (MEPs) said that some countries were reportedly developing lethal autonomous weapon systems, or “killer robots”, ranging from “missiles capable of selective targeting” to “learning machines with cognitive skills to decide whom, when and where to fight”. The Parliament wants to prevent the development of this kind of weapon, advocating for an international ban on lethal autonomous weapon systems. While the resolution was backed by a large majority, some MEPs were concerned legislation could limit scientific progress of artificial intelligence (AI). Last month, talks at the United Nations failed to reach consensus on this issue, with a number of countries saying the benefits of autonomous weapons should be explored. EU wants to create a Network of Cybersecurity Competence Centres to boost ‘Europe-wide’ cybersecurity. The European Commission has put forward a proposal on the creation of a Network of Cybersecurity Competence Centres, including a new European Cybersecurity Industrial, Technology and Research Competence Centre to invest in “stronger and pioneering cybersecurity capacity in the European Union”. The mission of the network is to help the EU to create an inter-connected, Europe-wide cybersecurity industrial and research ecosystem. It should encourage better cooperation between relevant stakeholders to make the best use of existing cybersecurity resources and expertise spread across member states. Commission proposes new rules to get terrorist content off the web. In last week’s State of the Union Address 2018, the European Commission’s president Jean-Claude Juncker proposed a new piece of regulation to get terrorist content off the web within one hour. 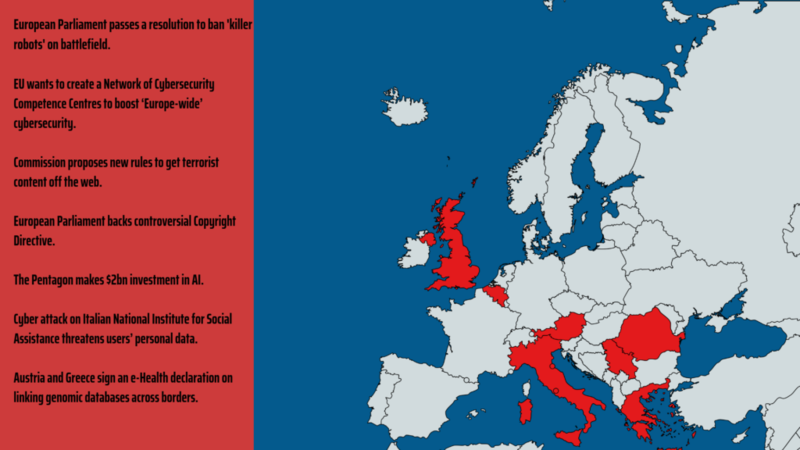 According to this proposal, every platform that wants to provide services in the EU will be subject to “clear rules to prevent their services from being misused to disseminate terrorist content”. The new rules are being presented one week ahead of the Ministerial Informal Meeting in Salzburg where EU Leaders are expected to discuss security. European Parliament backs controversial Copyright Directive. Members of the European Parliament (MEPs) last week adopted amendments to the controversial EU Copyright Directive following on from their previous rejection of the proposed regulation, adding safeguards to protect small firms and freedom of expression. The new regulation’s key goals are protecting press publications, reducing the “value gap” between the profits made by Internet platforms and content creators, encouraging “collaboration” between these two groups, and creating copyright exceptions for text and data mining. The European Parliament’s position strengthens the Commission’s proposed plans to make online platforms legally liable for copyright infringements. This would also apply to snippets of news, where only a portion of a news publisher’s text is displayed. In practice, this liability would require these involved parties to pay the rights holders for copyrighted material that they make available on their platforms. The Pentagon makes $2bn investment in AI. The Pentagon’s Defence Advanced Research Projects Agency (DARPA) has announced a multi-year investment of more than $2bn (£1.5bn) in its “AI Next” artificial intelligence (AI) campaign. DARPA is an agency of the United States Department of Defence responsible for the development of emerging technologies for use by the military. It comprises approximately 220 government employees who oversee about 250 research and development programmes. DARPA said that under its ‘AI Next’ campaign, key areas to be explored will include “automating critical DoD business processes, such as security clearance vetting in a week or accrediting software systems in one day for operational deployment; improving the robustness and reliability of AI systems; enhancing the security and resiliency of machine learning and AI technologies; reducing power, data, and performance inefficiencies; and pioneering the next generation of AI algorithms and applications, such as ‘explainability’ and ‘commonsense reasoning’. The US commitment of $2bn compares with EU targets 20bn euros investment in AI by 2020. In 2016 European private investments in AI totalled around 3bn euros, compared to Asia’s almost 10bn euros and America’s 18bn euros. The portal of the Italian National Institute for Social Assistance (INAS), has been hacked, potentially putting the personal data of its users at risk. The authority said the data stolen includes users’ data such as email address, password and, where indicated, telephone number and profession. The organisation reiterated that the data relating to its current procedures and activities carried out in its offices were not stored on the portal, and so was not subject to the data breach. United Smart Cities and Deutsche Telekom sign global partnership. United Smart Cities and Deutsche Telekom have announced a collaboration to join forces in supporting cities to become “smarter and more sustainable”. The United Smart Cities program is a global initiative established and coordinated by the United Nations Economic Commission for Europe in cooperation with the Organization for International Economic Relations . The partnership aims to address key issues cities face today by providing projects and solutions in cooperation with cities across the globe. These include smart street lighting, air quality monitoring or smart parking. Austria and Greece sign an e-Health declaration on linking genomic databases across borders. Austria and Greece have become the 15th and 16th countries to sign the European e-Health declaration on linking genomic databases across borders. The declaration was originally launched on April 10 during the Digital Day and has been since then signed by Greece, Bulgaria, the Czech Republic, Cyprus, Estonia, Finland, Italy, Lithuania, Luxembourg, Malta, Portugal, Slovenia, Spain, Sweden and the UK. Barnier will tomorrow (September 18) brief the European Council on the Brexit talks with the UK. At the meeting, European ministers will discuss the state of play of the negotiations, concerning both the completion of the work on withdrawal issues and the discussions on the framework for future relations with the UK. “An agreement on a future relationship can only be negotiated and concluded once the UK has become a third country. However, an overall understanding on the framework for the future relationship will be set out in a political declaration accompanying and referred to in the withdrawal agreement”, it added. The next meeting of the European Council (Article 50) will be held on October 18. The day after the meeting (September 19), Theresa May heads to Salzburg for a crucial EU summit, with hopes rising that a deal might be on the horizon. However, the fate of May’s Brexit plan is still in doubt as it is unclear whether she could command the 320 votes she needs in the House of Commons, the lower house of the British parliament, to approve a deal. As the country now faces a choice between this Brexit deal or a ‘no-deal’ Brexit, London mayor Sadiq Khan said voters should be given another referendum. The Times also reported this week that the EU’s chief negotiator, Michel Barnier, is now working on a new protocol text outlining how to use technology to minimise checks on the Irish border. On the Labour side, with its annual conference in Liverpool less than a week away, the pressure is mounting on Jeremy Corbyn to change his position and back a second referendum if parliament votes down the final deal. The Liberal Democrat Autumn Conference continues in Brighton. Welsh Secretary Alun Cairns convenes with an Expert Panel in Wales to discuss the challenges and opportunities presented by Brexit. Jean-Claude Juncker, will attend the ‘Three Seas Initiative Summit’ in Romania to discuss energy, transport, digital interconnections initiatives in the Central and Eastern Europe area. Commissioner for Digital Economy and Society Mariya Gabrielto visit Serbia to discuss implementation of the Digital Agenda for Western Balkans. The Commission’s chief negotiator, Michel Barnier, will brief the Council, meeting in EU 27 format, on the Brexit talks with the UK. The United Nations General Assembly convenes in New York, continuing through October 5. The Assembly is likely to spend some time discussing digital issues. The Liberal Democrat conference continues in Brighton. Foreign Secretary Jeremy Hunt to meet with Japanese Prime Minister Shinzo Abe . DCMS Secretary Jeremy Wright to speak at the Royal Television Society annual conference. Sir Alan Duncan, Minister of State at the Foreign and Commonwealth Office to speak at the IAEA in Vienna. Matt Hancock visits China to promote co-operation on healthcare innovation. DCMS Secretary Jeremy Wright will meet EU Commissioner for Justice, Consumers and Gender Equality Vera Jourova. EU leaders will hold an Informal Summit in Austria to discuss Brexit, illegal immigration and qualified majority voting in foreign policy. A delegation from the European Parliament Education and Culture Committee will travel to San Francisco to meet representatives from the tech industry (Google, Facebook, Netflix and Apple), academia and civil society. The MP Owen Paterson will speak at a Heritage Foundation event on Brexit. South Korean President Moon Jae-in will meet with North Korean leader Kim Jong Un, for the third inter-Korean summit of the year. Housing, Communities and Local Government Secretary James Brokenshire and the Shadow Housing Secretary John Healey will speak at the National Housing Federation Summit. Tracey Jessup named as CIO and MD of Parliamentary Digital Service. The European Week of Regions and Cities is an annual four-day event during which cities and regions showcase their capacity to create growth and jobs, implement European Union cohesion policy, and prove the importance of the local and regional level for good European governance. During the third day of the event (October 10), the ISAÂ² Programme, boosting digital public administrations in Europeworkshop is expected to take place. The workshop aims to address the main eGovernment and interoperability issues and produce guidelines and training for the digitalisation of public administrations at local and regional level as well as e-tools for networking and boosting administrative capacity for EU funds management.